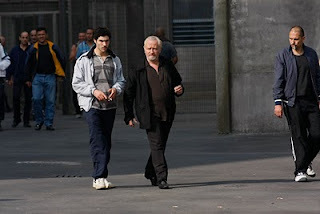 In his first two films, Jacques Audiard made me want to really like him, and while the world went a bit gaga for "De battre mon Coeur s'est Arrete" (and I enjoyed it well enough), I felt something just missing for me. I therefore may have approached "Un Prophete" with more than a bit of anxiety. I needn't have for within a single minute I fell headlong into the dangerous world of one of 2009's most powerful films. Aduiard draws us into the life of 19 year old French/Arab Malik El Djebena, a street kid, now incarcerated for the first time in an adult prison. Malik wishes nothing but to be left alone and serve his six years without incident. He never gets that chance. For two and a half hours, we ar mesmerized as we witness Malik's journey from innocence and subservience to the most powerful king pin in the prison. Tahar Rahim's performance is nothing short of astonishing, making the morose and frightened Malik a character you can only route for throughout his tortured six year stint. Uneducated, but wise beyond his years, the young prisoner improves himself through education, craft, cunning allowing his restlessness to steer him in whatever direction it needs in order to survive. As César Luciani, overlord of the prison, Niels Arestrup's is the perfect foil to Rahim's Malik and the scenes between Corsican master and Arab servant crackle with a nervous energy while Aduaiard keeps layering tension, mistrust, honor, privilege and loyalty into the mixture leading everything to a predictable, but wholly satisfying conclusion. Audiard's style makes life in this prison alternately real and surreal tossing in elements of fantasy and madness which coalesce with a beautifully distrubing madness, such as Malik's repeated visitations of his first victim, a man he was forced by Luciani and his thugs in order to justify his own existence. You cannot make a prison movie without kindness and brotherhood entering into the equation and the friendship between Malik and fellow Arab prisoner, Ryab (a terrific performance by Adel Bencherif) establish a bond that will be not only far reaching but ultimately the salvation for both men. Racism, too is ever a present guest here and I could only watch in wonder and respect as Malik moves between the Muslims, Egyptians, Italians, Corsicans and French judging the worth of each on their own merits (or how he can best use them) rather than the prejudice the others use to define their worlds. 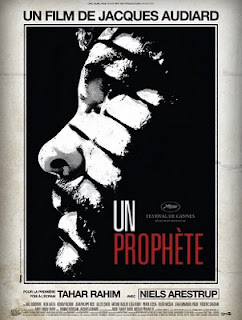 Dark, gritty, powerful yet full of hope, "Un Prophete" beats just about any U.S. studio made film last year and I hope it receives the recognition it deserves Stateside. A truly remarkable and emotionally rewarding movie. Jessye Norman: Roots - Album of the Year! The Last Airbender: Better than you think!